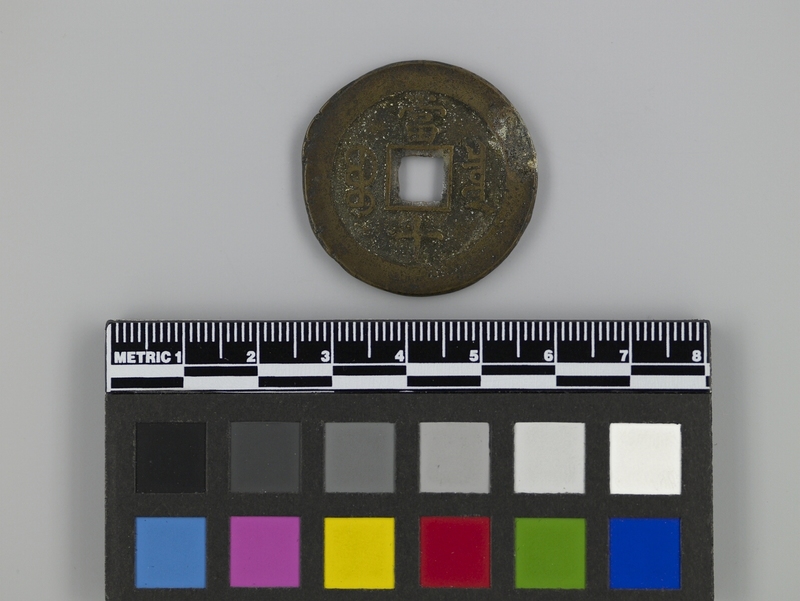 Item number Edz2289 from the MOA: University of British Columbia. Round coin with a four-sided hole in the centre, and a rim around the outer edge and the centre hole. The obverse has four characters, and the reverse has four characters. Xianfeng zhongbao (top-bottom-right-left) in formal style Chinese characters are on the obverse; boo ciowan left-right (mintmark) in Manchu, dang shi, top, bottom (value 10) in Chinese are on the reverse. Extra metal is at the rim right; extra metal is inside the centre hole; rim pits, flaws. Large size circulating coin, value 10 cash coins. Higher value, due to inflation and military payments during Taiping uprising.